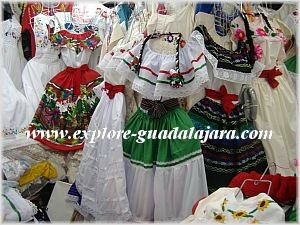 Guadalajara culture.. experience it first hand. Every Mexican city, town or village has something special that sets it apart from all others. This is what makes exploring Mexico so much fun. 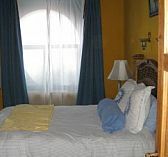 What do others say about visiting Guadalajara? Guadalajara culture is no different and offers many fascinating sights, smells and new sensations and old traditions for you to experience. If you've never been to Guadalajara then you are in for a very culturally rich experience. Guadalajara has deep roots and the city has never forgotten its past. You'll notice this from the bright and colorful traditional dresses of the Ballet Folklorico dancers, delicious traditional cuisine to the unique music of the popular mariachi and even the devotion to the Patron Saint of Guadalajara. Guadalajara is a modern city, with many modern conveniences like Walmart, Sam's Club as well as many chain restaurants, however, you'll still find many open air markets, street vendors, taco and torta stands and much more scattered throughout the city. The residents of Guadalajara know where they come from and there is a very strong sense of pride in their voice when they call themselves "Tapatios." A Tapatio, is something or someone from Guadalajara. 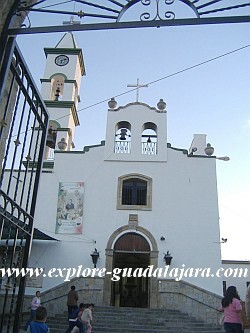 It's definitely an experience to visit and you get a great chance to experience the unique Guadalajara culture. Mission Style Church "El Santuario"
When I first arrived in Guadalajara, I couldn't help but be impressed with how polite people are. 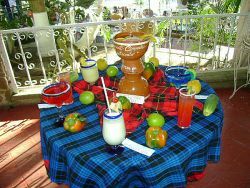 The Mexican culture, in general is very respectful and at times quite formal. I've found this to be true especially in social situations. A little "Buenos dias," (in the am) and a smile can really go a long way, even if you are not very familiar with the Spanish language. Tip: Whenever entering stores or businesses or when you make eye contact with people, it's nice to greet them by saying, "Buenos dias," (which is good morning) in the morning and "Buenas tardes," (good afternoon) in the afternoon. When you take a stroll through the downtown district (don't forget to check out this Guadalajara, Mexico vacations walking tour) and even scattered parts of the city, you'll notice the influence of Spanish flavor in the beautiful colonial architecture and mission style churches. You'll discover that the city of Guadalajara is very modern and full of many fashion forward teens and young adults who, of course, want to keep up with the latest trends and styles of the world. While you won't see many people wearing the traditional Mexican clothes of long ago you can still see hints of it throughout the city. If you want to purchase traditional items you're sure to find them in one of Guadalajara's large markets like "San Juan de Dios." It is an older market where you can buy anything from custom belts, panchos, sombreros to traditional Mexican embroidered shirts and dresses and so much more. Find out Mexican fashion collection from amazon. 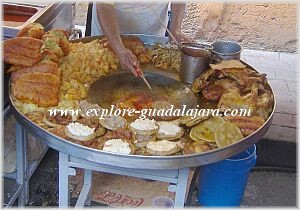 Traditional foods in outdoor open air market Guadalajara culture is also full of delicious, savory dishes that are specific to the state of Jalisco (which Guadalajara is the capital of). Check out some popular food stops recommended by other visitors. A dish that I've yet to try is something called "Birria," which is a hearty stew made of goat's meat, tomato sauce and other spices. It is topped with fresh, chopped onions, a sprinkle of lime and eaten with homemade, white corn tortillas. Is your mouth watering yet? Another old time favorite is called the torta ahogada, which is delicious pork meat cooked to perfection and served "sandwich style," on a hunk of crusty bread. This special sandwich is topped with onions and refried beans and literally sits in a shallow pool of special tomato sauce and seasoning, hence the "drowned" name. This is best enjoyed with spoon in hand to scoop up some of that sauce. Read more about the tasty restaurants in Guadalajara, along with my favorite that serves those deliciously famous tortas. 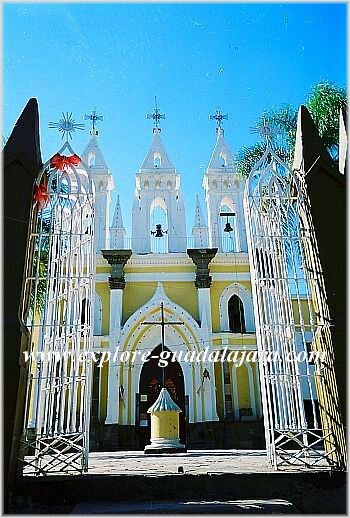 Since a large percentage of Guadalajara citizens are Catholic, there is an overwhelming display of love and devotion to the Patron Saint of Guadalajara; lovingly nicknamed "La Generala" (the general). The Virgin of Zapopan, which is her rightful name, even has her own celebration every year to commemorate visits to the local churches of the city. Read more about the Virgin of Zapopan, her lively celebration and just how important she is to her faithful admirers. How can we talk about Guadalajara culture without mentioning the arts of painting, dance and music. Guadalajara has much for you to appreciate such as beautiful Mexican Murals, throughout the city. Quite a few are by Jalisco native and famous muralist Jose Clemente Orozco. Take a peek at a few of my favorites. 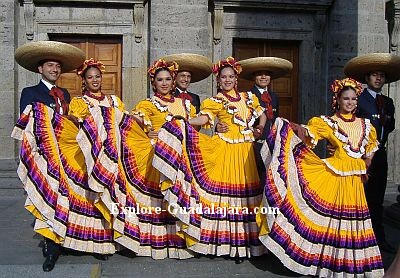 Dance in Guadalajara is also very famous and popular worldwide.. and you've probably heard of one of them called the "Mexican Hat Dance," however in Spanish it is called "Jarabe Tapatio." This dance originated in Jalisco and is very popular. The Ballet Folklorico in every state perform this dance and it was honored as being Mexico's National Dance. When you think of Mariachi.. you immediately picture men in their elaborate costumes and sombreros singing lovely ballads to beautiful senoritas. Jalisco is home to the Mariachi and Guadalajara and even hosts a worldwide Mariachi festival every year in September. What makes the Mariachi so special is that not only did they originate from Jalisco, but they can only be considered a true "Mariachi" if they dress and use the same song style as that of Jalisco. 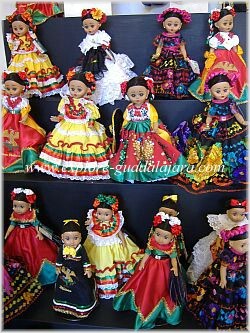 Do you have any stories, comments or observations about Guadalajara Culture? Please submit them here.